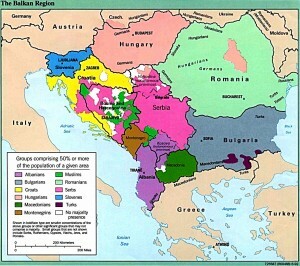 Situated in the Rila Mountains, about 70 miles south of the capital city of Sofia, at 1,150 meters above sea level. It is believed that this monastery was founded by a hermit named John of Rila, who lived in the 10th century in a cave near the monastery. 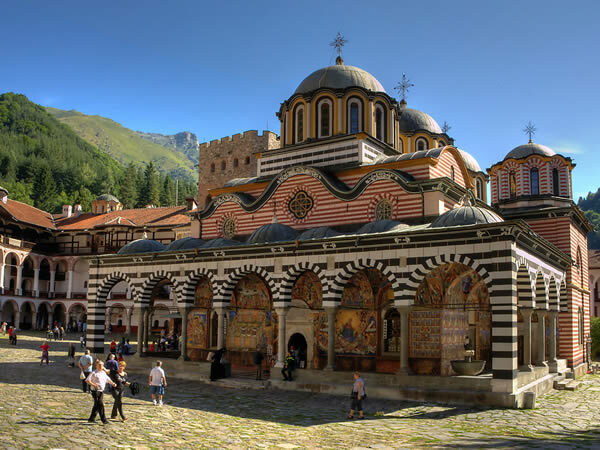 The Rila Monastery is considered to be built by the pilgrims scholars, who came to be taught by John of Rila. The current appearance of the monastery is the 19th century due to a fire happened there. The buildings that form an irregular quadrilateral, were made in 1816. In the center of the courtyard stands an imposing stone tower and the oldest of the complex, built by feudal lord Hrelyu in 1335, with a small church, newest, next to the tower. The whole complex is impressive for its size, just the dorm place has 4 floors with cells for no less than 300 monks, there are four chapels, abbot’s room, a library, rooms for pilgrims and the kitchen, that is characterized by large pots. The exterior of the monastery is even more interesting with stone walls, recalling a military fort rather than a monastery. You have to visit the museum of the Monastery, which contains a unique work of art, namely Raphael Cross, which is made of a whole piece of wood (81cm x 43cm) and is named after its creator. It has 104 religious scenes and 650 small figures on the cross and was completed in 1802 after the monk who worked it, has lost his sight to work on it for at least 12 years. The site was declared a National Historic Landmark in 1976 and since 1983 is on the world heritage list of UNESCO.